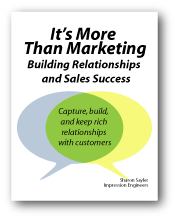 Building Relationships and Sales Success. Business Relationship Building Starts NOW! Register for the 7-Day Relationship Building Strategy e-course. To help you apply the concepts and strategies in "It’s More Than Marketing: Building Relationships and Sales Success," we’ve developed an entire e-course that includes Impression Engineers unique planning tools, your strategy sessions and other bonuses. Register below and get started today!